We address the problem of data-driven pattern identification and outlier detection in time series. To this end, we use singular value decomposition (SVD) which is a well-known technique to compute a low-rank approximation for an arbitrary matrix. By recasting the time series as a matrix it becomes possible to use SVD to highlight the underlying patterns and periodicities. This is done without the need for specifying user-defined parameters. From a data mining perspective, this opens up new ways of analyzing time series in a data-driven, bottom-up fashion. 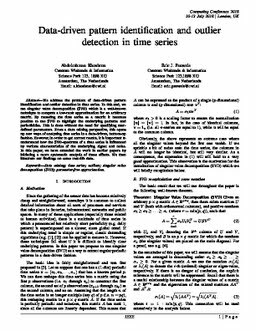 However, in order to get correct results, it is important to understand how the SVD-spectrum of a time series is influenced by various characteristics of the underlying signal and noise. In this paper, we have extended the work in earlier papers by initiating a more systematic analysis of these effects. We then illustrate our findings on some real-life data. Khoshrou, A, & Pauwels, E.J.E.M. (2018). Data-driven pattern identification and outlier detection in time series.